Prepare the Brussels sprouts by trimming off the ends, removing loose and yellowing leaves, and cutting them in half, top to bottom. Prepare the Carrots by peeling, cutting off the ends, then cutting each carrot in half lengthwise. Next, slice each half into 1/8″ thick half-moons. Crush, peel and roughly chop the Garlic cloves. Peel and thinly slice the Brown Onions. Soften the Chicken broth cube in 1/2 cup warm water. Place the Olive Oil and all of the ingredients, except the canned Tomatoes and Chicken broth, into a large wok, over High heat. Sauté the vegetables for 4 to 5 minutes, tossing with two spatulas the entire time, to soften the Garlic and Onions and thoroughly heat all of the vegetables. Pour in the canned Tomatoes and the Chicken broth. Stir well. Cover the contents of the wok with a lid, and reduce the heat to Medium-Low. After 3 minutes, remove the lid and stir. Steam the vegetables until the Brussels sprouts are tender but still crisp and green. Remove the lid after 5 minutes, and remove a sprout to taste. Cook a few minutes more if necessary. Cook the beans until just tender and still slightly crisp. Pour over the beans and serve soon. Silverbeet and corn on the cob ripen at the same time in the New Zealand summer, so make a colorful and delicious soup. Be careful to avoid overcooking the corn. 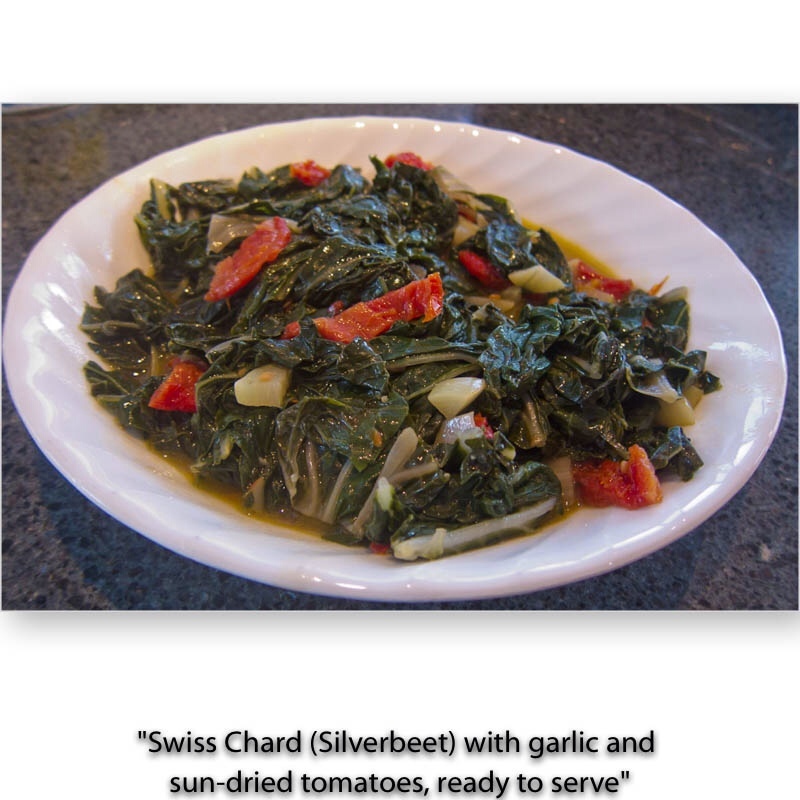 1 – Remove the leaves from the stems of the Silverbeet and cut the leaves into large pieces. Rinse thoroughly and drain. 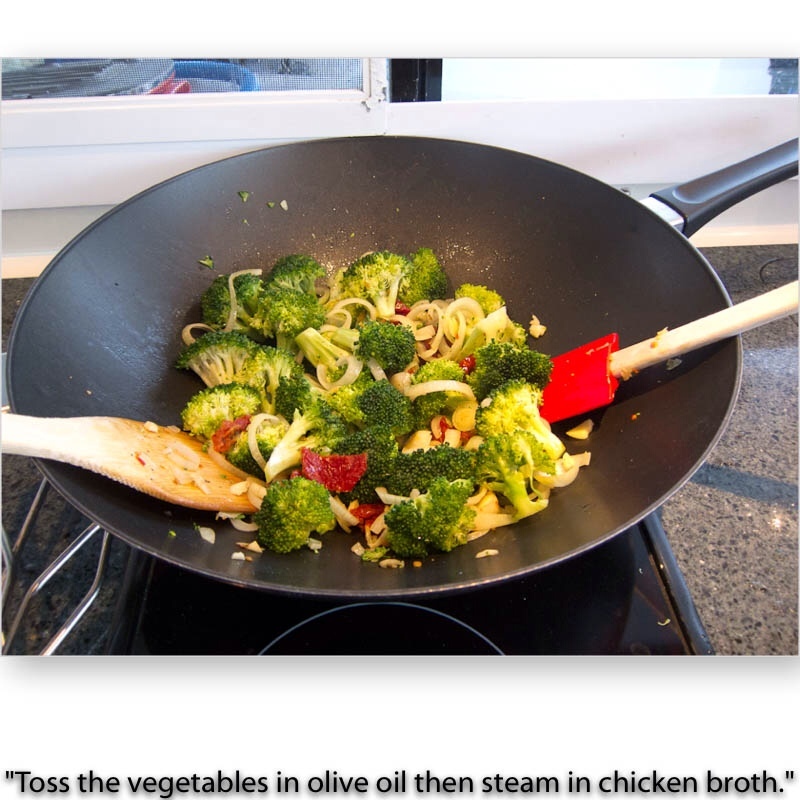 2 – Heat the Olive Oil in a Wok or large skillet, and saute the Garlic for 1 minute. 3 – Add the Silverbeet leaves, a sprinkle of Salt and a couple of grinds of Fresh Black Pepper, and stir-fry for 3 minutes. 4 – Add corn to the Wok and toss and stir. 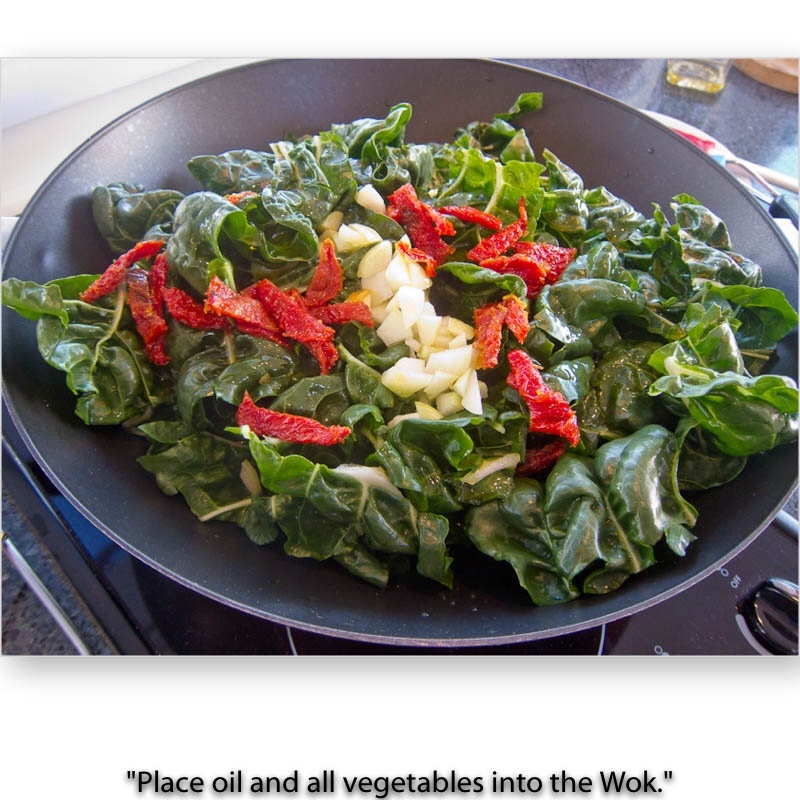 Place a lid on the Wok to steam for about 2 minutes, until the silverbeet is tender. Quantities of the above ingredients, according to number of people being served. Sauté the Garlic in hot Olive Oil in a Wok over High heat, for 1 minute until beginning to brown. Add Sun-dried Tomatoes to Garlic and sauté for 1 more minute. Add the Spinach, Salt and Pepper, and toss to coat the Spinach with Oil and mix all the ingredients well. Continue to cook and toss as the Spinach begins to wilt. Add a lid to the Wok, and turn down the heat to Low. Allow to steam for 3 minutes. Taste to be sure Spinach is tender. Pour contents of Wok into a heated serving bowl and sprinkle with the Parmesan Cheese. The Farmers' Market in Whangarei, New Zealand was a source of the summer's best freshly picked corn. We developed this simple and delicious recipe to enjoy aboard ADAGIO while were were stuck in the Town Basin Marina for ADAGIO's 12-year refit. Use very fresh corn. Keep it in the refrigerator until you are ready to make the soup. This soup is quick to make, and quite satisfying. 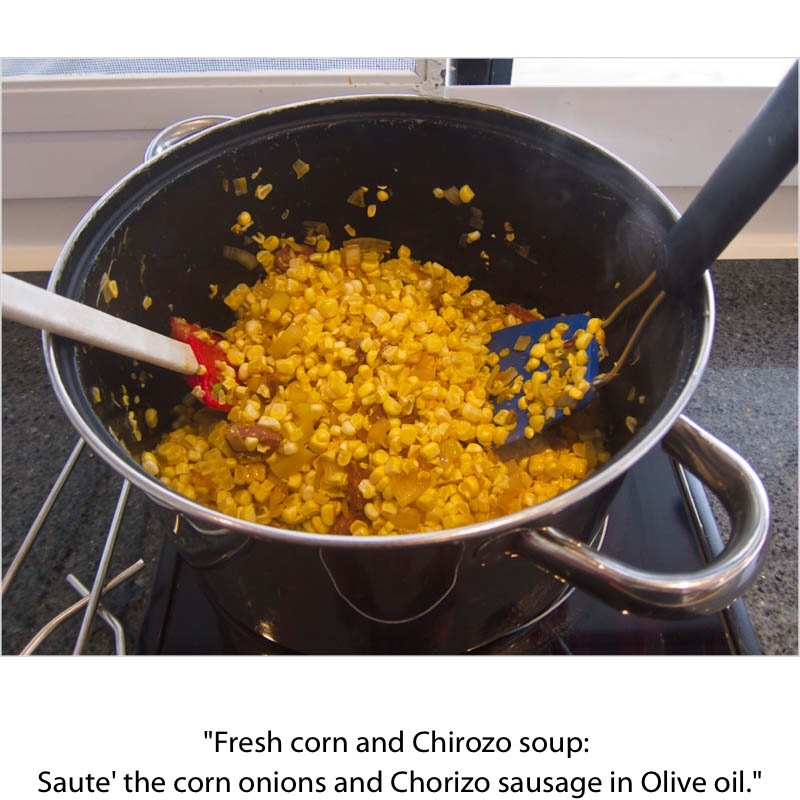 You should obtain good results using frozen corn, but I have not tried this. Be sure not to overcook the corn, or it will lose its sweetness. If you cannot obtain Chorizo sausage, use a lean, smoked bacon, and remove the fat from the pan before you add the onion and garlic. Do not overcook the sausage, as you want to get your teeth into it when you are eating the soup. Be sure to use Sweet smoked paprika, NOT HOT smoked paprika. There is a big difference. Over Medium heat, in a medium sized soup pot, heat the oil. Sauté the Chorizo and onion, until the onion is translucent, but not until brown. Turn up the heat to High and using two spatulas or wooden spoons toss all the ingredients for a few minutes, until all is heated and covered with oil. Do not allow ingredients to sit in the pot. 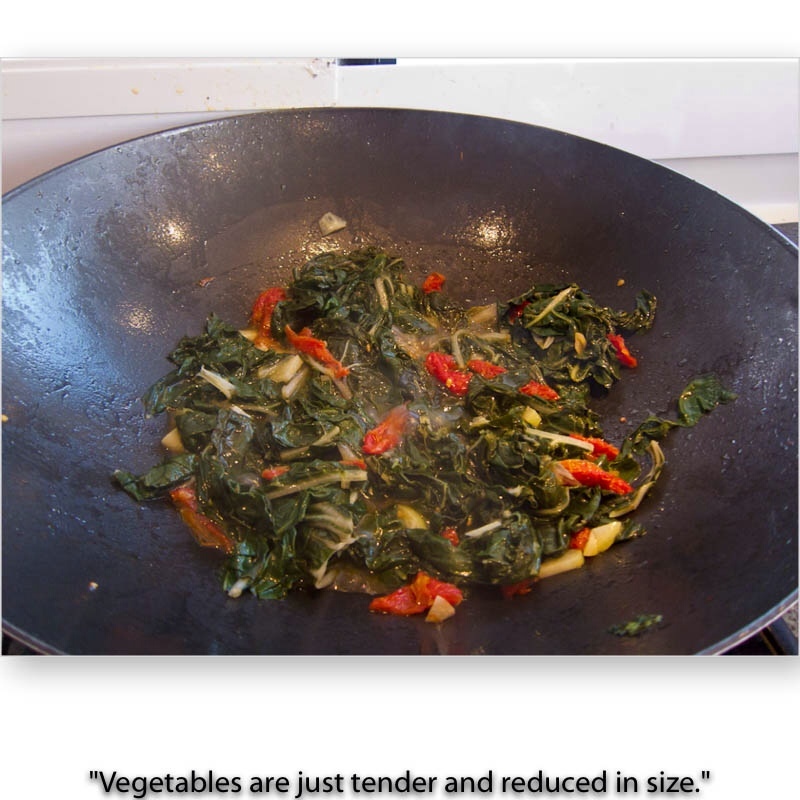 Keep tossing, as in a stir-fry, until the corn is heated, but not burned and not over-cooked. Add the chicken broth and the Paprika. Stir until the soup is hot. Do not boil, or you will overcook the corn. Remove the pot from the stove top. 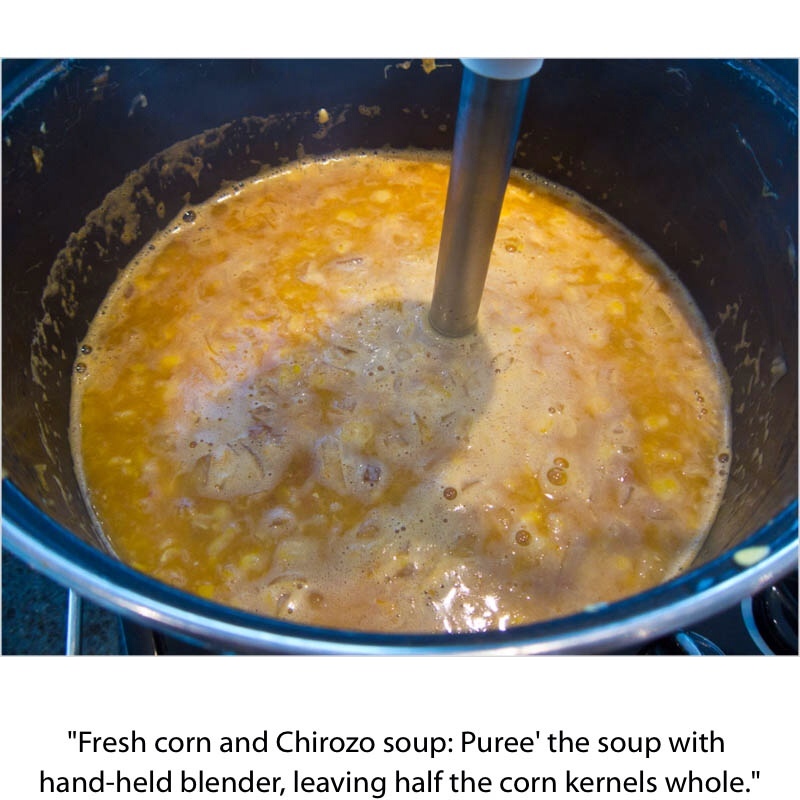 Blend the soup with a hand blender to thicken, but leave at least half of the corn kernels whole. Garnish each bowl of soup with the crisp slices of Chorizo sausage. Serve immediately with crusty bread and a little hard cheese. Place olive oil, brussels sprouts, onions and salt and pepper in a skillet or a Wok. Stir fry over High heat for 1 to 2 minutes, until everything is hot and covered with oil. Pour in the hot chicken broth, bring to a boil, place a lid on the pan, reduce the heat to Low and simmer. Meanwhile, toast the walnuts in a microwave for 2 minutes on High, or in an oven. Stir the brussels sprouts from time to time, checking to be sure that the liquid has not boiled away. Add small amounts of hot water from time to time if necessary. Taste a hot brussels sprout after 5 or more minutes of steaming. 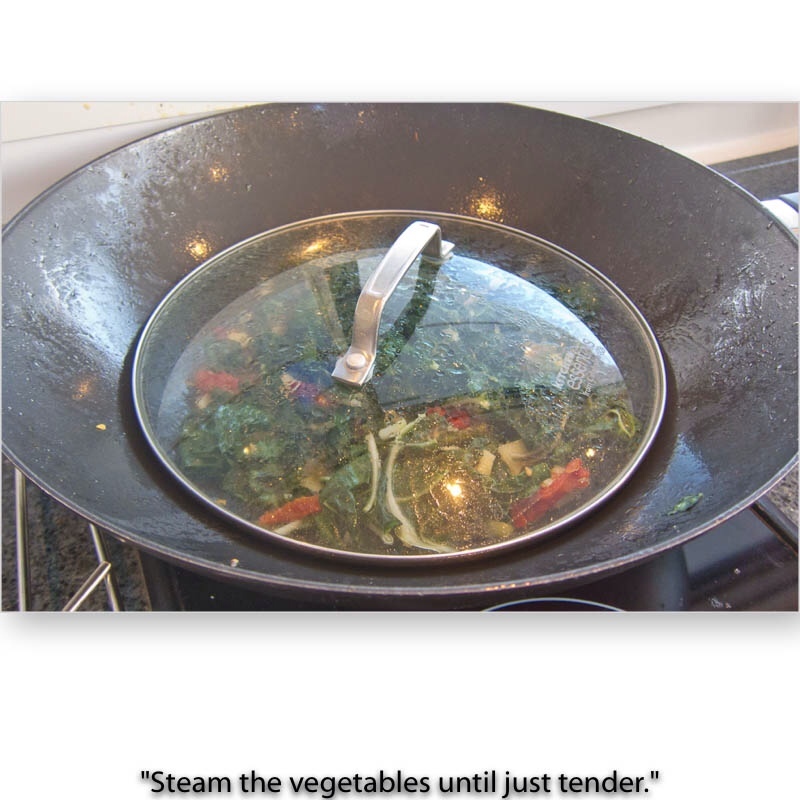 If still hard and “raw”, replace the lid and continue to steam. 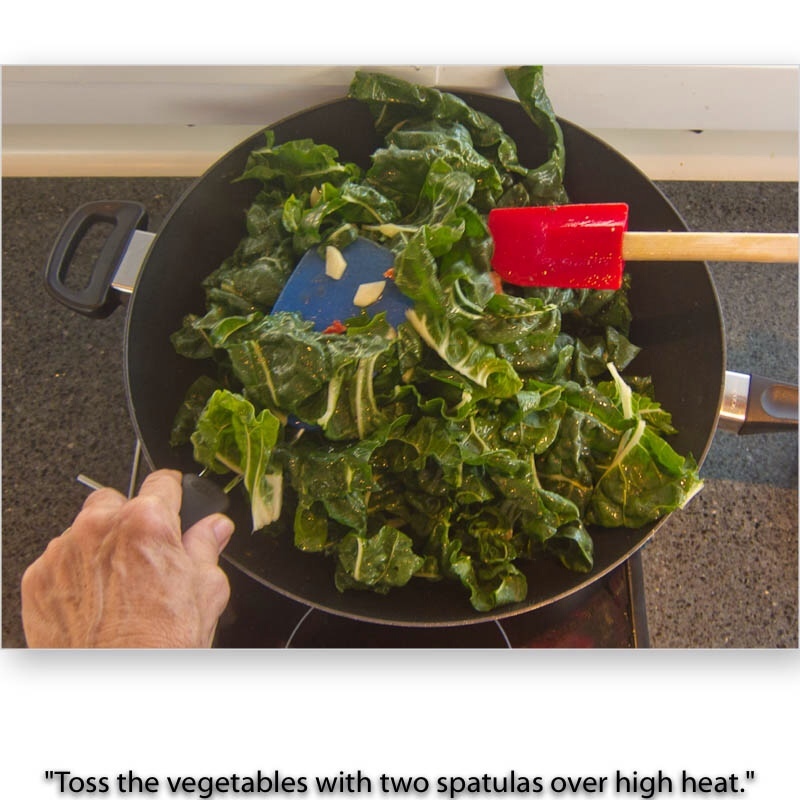 When the brussels sprout is cooked through and still “crisp”, remove the skillet from the burner, leaving the lid on. Just before serving, stir in the toasted walnuts, and pour into a warm serving dish. As we have resolved to eat more vegetables, I have developed a fool-proof method for cooking delicious mixed vegetables in my Wok. 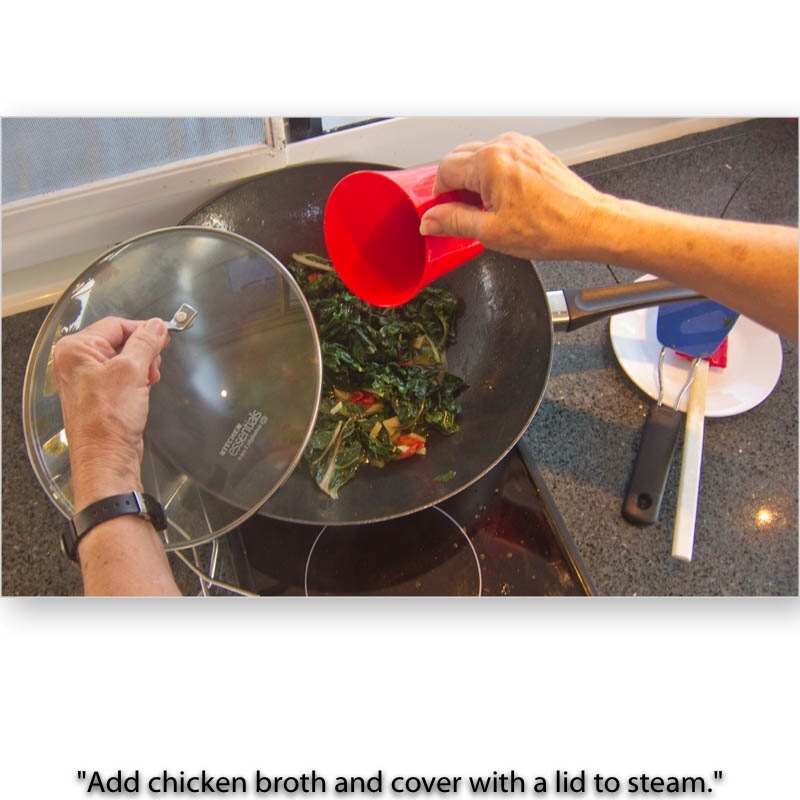 You will need a Wok or skillet with a lid and 2 heat-proof spatulas. First you will stir-fry the vegetables and seasonings in hot oil, then add chicken broth and steam until the vegetables are just cooked. Add the Beans, Carrots and Sun-dried Tomatoes, and toss to completely coat with Oil and to heat through. Place the lid on the Wok, and turn down the heat to steam for 4 minutes. Add a little water if the broth evaporates away. Taste the Beans to test for tenderness. When the Beans are tender, pour the mixture into a serving dish.